I finally found time to finish my Two Zip Hipster bag. I saw How About Orange's review of the pattern and knew I had to make one for myself. I have found that if I break it into small manageable steps, I am more successful finishing projects. I cut out the pieces one night. Then interfaced the pieces the next night. Then I completed the front piece with the pocket. Then put the bag together. It took all week to finish, but didn't seem like I spent hours slaving over it. The pattern is very detailed and easy to follow. 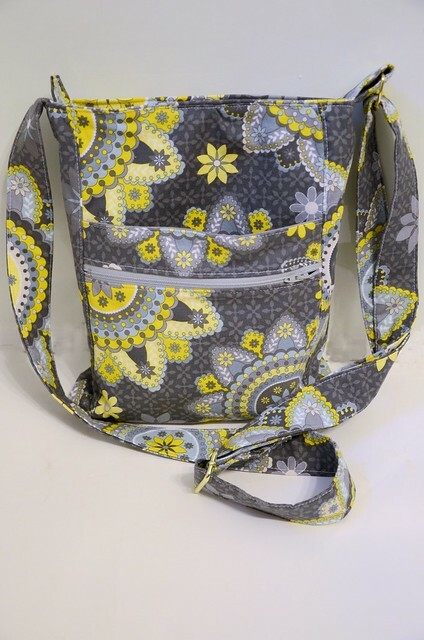 I love the front zipper, plus the top zips close so I can keep all my belongings nice and secure. It is even big enough to hold an iPad, but doesn't feel huge when you are carrying it. It even has an adjustable strap. I would highly recommed this pattern. Here's a link to the fabric I used in case anyone is interested. This week I am hoping to put together a baby quilt. If you get a chance check out Sewcanshe.com today, she is featuring my Snack Bag Tutorial. I have been trying to do small bits of sewing too. It' the only time I seem to have lately. I am hoping for some real sewing time this weekend, though. LOVE this...I really need a bag to carry my camera around in when we vacation in a few months. This might work? I LOVE the fabric, too. And totally agree that it works better if you break stuff down...I'm doing that right now. Finishing up a project I started last night. Love this bag, you did a great job. Love the fabric. Do you recommend the pattern for a newbie? Directions for this pattern are amazing. I think anyone could sew this bag very easily as long as the directions are followed. I have made so many now that I think I could make them without looking at instructions, but I always do!